In a report published by Shelter, 2,634 people here in Kent are sleeping rough, have no permanent home and are in emergency accommodation. However, 1,059 of these people are living in Medway alone. The Medway towns have seen one of the worst rises in homelessness over the years, and yet despite strategies and funding being put in place, nothing seems to change, and the problem only gets worse. 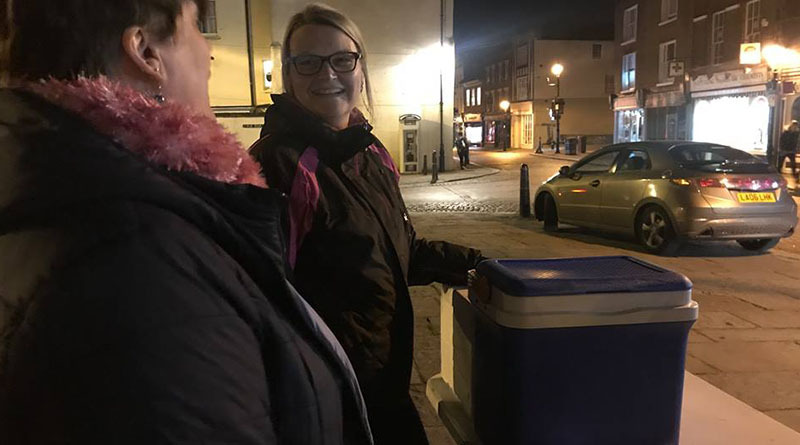 Volunteer led organisation Time 4 the Homeless has spent the last year working through Chatham, Rochester, Swale and Maidstone to try to help those who are in need. Reporter Eleanor Keeling goes along to one of their soup kitchens to see how this project is benefiting the people of Medway. Wandering down Rochester High street on a cold blustery evening, normally when you see a crowded group of people opposite a pub it only means one thing, that someone has been bottled or a fight is taking place. However, in the glow on the Casino Show Rooms, this time blood isn’t been poured, but fresh cups of tea. If you grow up in the towns, you definitely would have seen an increase in the number of homeless people being on the street. Some days it seems as though you can’t walk down Chatham or Rochester High Street without seeing someone holding out a cap or a pot asking for spare change. This tragic sight felt all too real getting closer and closer to the tables laid out with food. As I saw one younger looking man approach the smiles of Time for the Homeless volunteers, I was astounded by how skinny and fresh faced he looked. They called him Twiggy, he was from Poland and had very skinny legs. “Curry or Sweet and sour chicken my love?” Amanda one of the helpers asked. Polystyrene containers were being used to keep food hot, and as Twiggy chose the curry he was also given many samosas and onion bhajis to keep him going. The sight of his smile and gratitude made me feel as if I could approach these people. But this is just a small fraction of what Time for the Homeless do. The organisation, which started a year ago by Michelle and her husband Mick, is a service which runs 24/7. They provide soup kitchens throughout the week across the Medway towns and Maidstone. They also offer support by having a 24-hour emergency hotline. 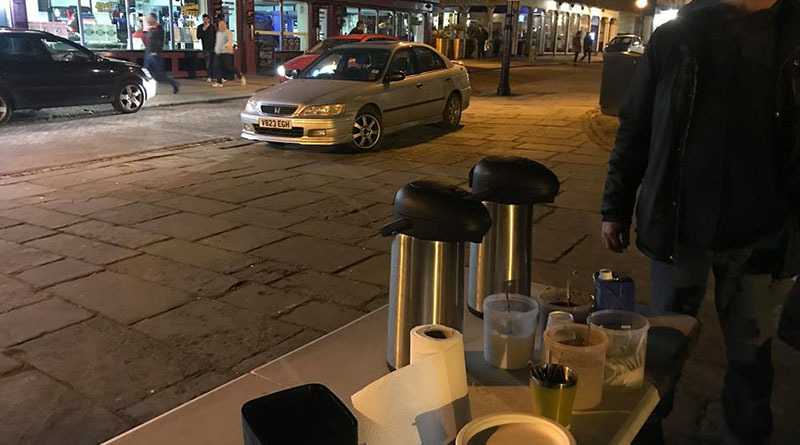 With the amount of people living on streets having dipped slightly yet still being high compared to most towns, the soon to be charity has been trying to do their bit to help. Yet funds for them are greatly limited, long-time volunteer Amanda explains to me just how in demand they are. 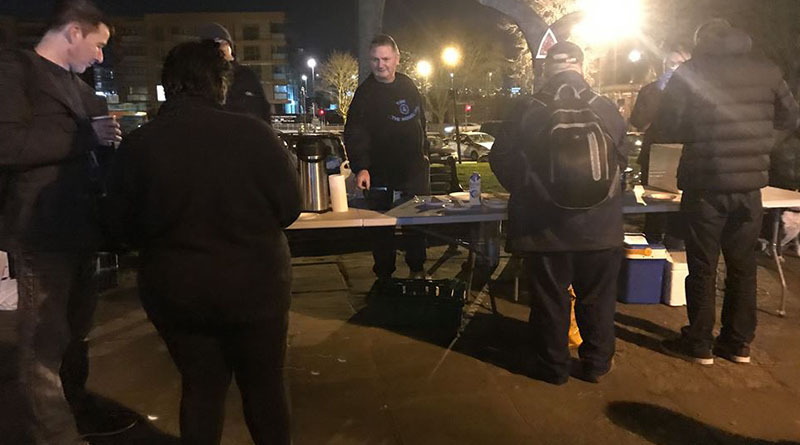 The small team of people which run Time for the Homeless, are a warm-welcoming group and being there I felt the warmth and friendly energy they bring to a somewhat sad evening. These people know the homeless, as bantering insults fly back and forth some cruder than others, they know how to talk to them, and I felt myself adopting the same persona at times. Team Leader Michelle was keen to tell me more about why she chose to help the homeless. “Three years ago, they told me I would never walk again when I had my stroke because I was completely paralysed, this has got me back up and, on my feet, and kept me going,” he said. After her stroke, Michelle felt the need to reach out to the people on the streets, and over a hot cup of tea, she points out to me the people that have been with them the longest. I meet Ruth who is holding a dog named Denzel who despite the weary look in his eyes, only wants one thing and that’s the chicken on the table. The most memorable however, was a middle-aged man called Dennis. Being one of the longest serving users of Time for the Homeless, he has gone through recovery and come out the other side. When I noticed this man standing in the corner, tucked away smoking a cigarette I felt compelled to talk to him, he looked out of place, that he didn’t fit in at either end of the spectrum. Dennis used to be on the streets, he has lived a hard life, yet here he was, back where he started but this time handing out the food and being an ear for those who need it. As he sits opposite, he takes a deep breath and tells me about how he ended living out of a backpack in Rochester High Street. Dennis had been on the streets a few months before he met Michelle, he had gone to numerous charities to ask for help, but it was with this community he felt most at home. Dennis is now one of the volunteers, he still has a rough time, having slipped up a few times since getting clean, but he is now in a better position than he was over a year ago because of Michelle and her team. Soon to open for the Spring, Medway will be the first place in Kent to open a homelessness hub as part of a £100 million government Rough Sleeping Strategy. The centre named, Somewhere Safe to Stay will cost the government £415,000 to build, and Medway is one area of 11 who will benefit from the program. It will offer emergency shelter for those on streets and support around the clock. Although this hub is soon to open, people like Michelle, Amanda and Dennis have been crying out for something like this for years. Michelle continues telling me how they have got solicitors, sexual health advisors all set in stone ready to come and help, it is just the funding and practicality of setting something like this up. Time for the homeless are in the process of being recognised as a registered charity, however for the time being, most of what can be seen is paid for out of the volunteers’ own incomes. With young families to feed, having met Michelle and Mick’s daughters, it is difficult to watch as these people give away so much when they don’t have much spare income themselves. Therefore, to be able to continue doing this fantastic work, the organisation is crying out for more help. This could be in the form of food donations so they can make meals in large quantities, blankets and tents. Yet, a spare pair of hands and a few hours of your time to become a volunteer would also help make the community grow stronger and combat homelessness once and for all.